When Europe's biggest AVR brand unveils a new flagship, it's time to take your head out of the popcorn bucket and pay attention. 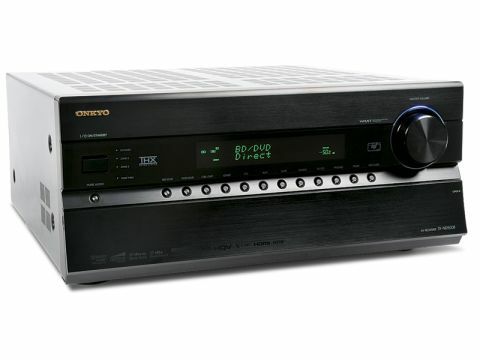 Not only has it outsold pretty much every other brand in the UK (and Germany) since 2009, but the Japanese marque has also consistently been first to market new AV receiver technology. As I write it sounds as if cars are being lobbed into each corner of my viewing room. Onkyo's latest heavyweight, the TX-NR5008, is in full flight. The heavy metal objects landing around me are Iron Drones, dropping down to square-off against Shellhead and War Machine, for their climatic face-off in Iron Man 2 on BD. What follows is 360˚ of bedlam, with ordnance panned every which way. The big NR5008 handles the DTS-HD Master Audio multichannel mix with thrilling precision. The wife complains that it sounds as if the house is being demolished. Welcome to home cinema sound on a devilishly large scale. If you're looking for a radical form factor to usher in 2011, then you won't find it here. The TX-NR5008 is a cookie-cutter battleship, indistinguishable from last season's TX-NR5007. Unlike rival Marantz, which has applied an entirely new design aesthetic to its latest AV receiver range, there's no fresh ground being trod here. Connections are extensive. There are eight HDMI inputs (including one under the fascia flap for a quickie console or camera hook-up), all of which are 3D capable (one of the key differences between this model and last year's NR5007 iteration). Also new is a PC VGA/mini-jack audio input that helpfully outputs over HDMI, and with a view to family friendly integration, you get HDMI pass-through for those who want to play a disc without utilising the AVR. A pair of HDMI outputs is provided to feed both a display and a projector, simultaneously if you like. Other niceties include Onkyo's Universal Port jack for iPod and peripheral accessories, Ethernet and USB (one on the rear, another under the fascia flap). Basically, if you need a connection, it's probably there.